Saint Brigid of Kildare, also called ‘Saint Bridget of Ireland’ is one of three Irish Patron saints along with Columba and Saint Patrick. This is a stainglass window at saint Brigid's Church at Killester. There is no doubt that Brigid did exist as her existence was recorded in the Irish annals (history records written by Irish monks). The annals of Tigernach recorded the year of Brigid’s death as 523 A.D. It seems quite certain that her birth place was Faughert near Dundalk in County Louth. There are conflicting accounts of her childhood and about who her parents were. 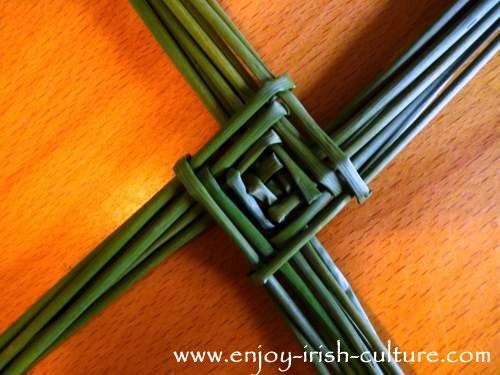 Brigid is revered all over Ireland and is associated with folk traditions such as the making of Brigid's crosses as the one seen below. The earliest biographer names her father as Dubhtach, chieftain and King of Leinster. Her mother may have been a slave in his service, kidnapped from England, (much as Saint Patrick is said to have been). Saint Patrick himself may have baptised her mother in captivity. Other sources state that her father was a druid who kept slaves, and that her mother was a slave in his service. Yet another version is that it was her father who was a slave. 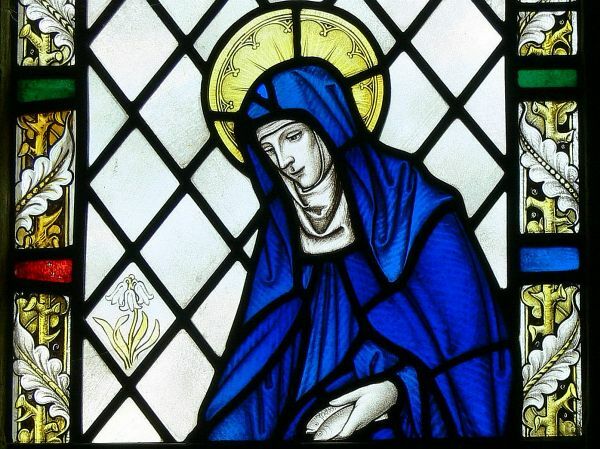 Same as Saint Patrick, Saint Brigid is or has become, very much a legendary figure. This actual conflict between the two faiths may have been present between Brigid's parents if the first version of her childhood story is true. Or perhaps, by naming her parents as a slave who converted to Christianity and a Druid or King of the pagan Ireland, her biographers may have made her life story a metaphor for what was happening in the country at the time. Brigid is said to have been very spiritual even as a child. One story tells us her pagan father tried to feed her as a toddler, and she vomited because he was impure. By those that chronicled the story this was interpreted as a sign of purity and early spiritual calling. As a young woman Brigid decided to become a nun despite attractive offers of marriage. She was ordained by either Saint Mel or Saint Mac-Caille. Saint Mel made her an abbess and some sources say she may even have been bishop. There is no doubt that she was a very powerful woman. She personally knew Saint Patrick and formed a friendship with him according to the Book of Armagh. Read here about Brigid's miracles, and here about her feast day and folk traditions. She founded a monastery and a nunnery both at Kildare and was abbess there together with Saint Conleth whom she appointed. These religious institutions became an Early Christian scholarly centre famous all over Europe. These monasteries played a huge role in preserving western knowledge throughout the middle ages. Brigid founded a school of art that produced the legendary Book of Kildare, an illuminated early Christian document probably similar to the Book of Kells. Unfortunately, the Book of Kildare went missing under Cromwell and is probably destroyed. Saint Brigid was buried at Kildare Cathedral in a decorated tomb. During the chaos of the Viking era, her remains were brought to Downpatrick for safe keeping where they were kept alongside those of Saint Patrick and Saint Columba, also Partron Saints of Ireland. Her skull is now displayed in a decorated metal urn where it can be seen through a glass window, at a small church in Portugal. The church wall boasts a plaque declaring Brigid’s head was brought there by three knights in 1283. Parts of the skull have been brought back to Ireland in the last century. Saint Brigid of Ireland is revered around the world in places as far apart as Portugal, Spain, Belgium, Switzerland and Cologne in Germany reflecting the importance she had as a figure in early medieval Ireland. Even the Orthodox Church pays homage to Brigid on her feast day. 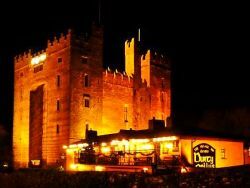 In her honour her convent in Kildare kept a sacred flame burning until the 12th century. (1) ó Cróinin, Dáibhí: Early Medieval Ireland 400-1200. We hope you enjoyed our article on Ireland's 'other' Patron Saint and her remarkable life. This website is a labour of love. Please support us in it by sharing and liking it socially! We have a selection of social features at the top left and at the very bottom of the page. Tell the world about us so that others will be able to enjoy our content, too! Thanks a million, warmest regards from Susanna and Colm.